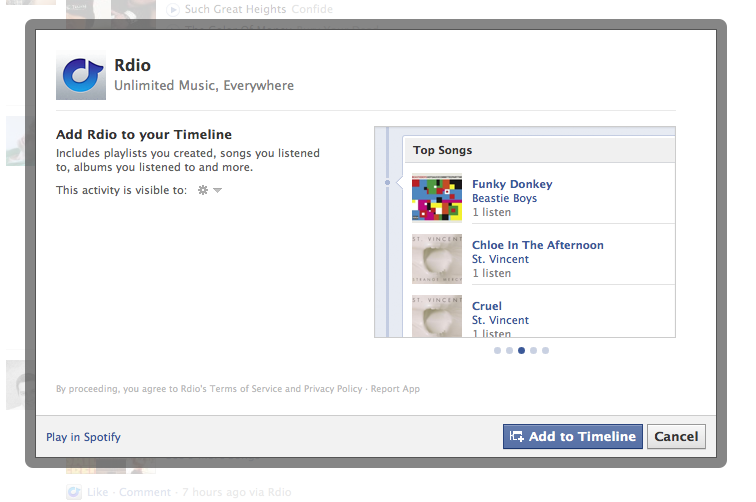 Well, in case you want to further delve into your friends’ terrible music taste, Facebook has just launched its Music Dashboard as a permanent bookmark in your profile’s left side bar. Inside Facebook’s Josh Constine points out that you can access it and dock it on your sidebar by clicking through to a friend’s Playlist or through this direct link here. Right now the Music Dashboard shows you what songs your friends are listening to — aggregating friend listening patterns by band– as well as Top Songs and something called Featured Music Services which for me at least is currently advertising Earbits and Spotify. While it seems like you must have at least one music playing partner app to listen to music through Dashboard, one of its coolest and most seamless features is that if you click on a song from a music player you don’t currently have Facebook gives you the, albiet mitigated, option to listen to it in your preferred player. So, yeah, be care before you click on your old college roommate’s update that they’re listening to the Divinyls “I touch myself.” Openness is a double-edged sword.